As a wider range of technologically sophisticated products comes on the market, the demand for sales engineers is projected to grow 7 percent from 2016 to 2026, according to The U.S. Department of Labor’s Bureau of Labor Statistics Occupational Outlook Handbook. Sales engineers, with their combination of strong technical and interpersonal skills, play a critical role in the sales process, directly impacting company revenues. With the growing importance of sales engineering teams, CloudShare recently interviewed some pioneers and leaders in the field to equip our readers with the best advice for how to implement technical sales engineer training and grow a sales engineering team at their organization. In this blog, we take a deeper dive into the importance of training your sales engineers (SEs). Successful sales engineers require a unique combination of technical knowledge and business acumen. “Sales engineers don’t just mimic sales reps. They’re in a unique position to forge different kinds of relationships. SEs can help cultivate relationships with people who are technical champions in the buyer company,” explains Jon Michaels, senior vice president of operations at Volta, a network of electric vehicle charging stations. Michaels built a sales engineering organization from scratch in his previous position as head of global sales engineering at EnerNoc, a leading provider of cloud-based energy intelligence software. Babette N. Ten Haken, a STEM-trained scientist, corporate strategist, and founder of Sales Aerobics for Engineers, agrees, stating that sales engineers’ ability to combine technical and non-technical perspectives can make them a relevant and valuable partner to both buyers and sellers. With the need for multidisciplinary skills, what types of training do you need to provide to your SEs? A well-trained sales engineer is your competitive advantage. Discover the power of virtual training labs today. “If we work to create better, more well-rounded professionals, the entire company benefits. It benefits from sales engineers who are highly skilled and really move the needle on deals, SEs that stick around for many years assisting you in ramping up your sales force, SEs who grow to become product owners, development managers, and even future sales engineering leaders,” Hanson adds. Companies often update products and release new ones, so Michaels “brought the product team to explain the nuts and bolts of the product. We did internal trainings on demos, and how to weave in new features,” he said. Teach your SEs how to “engage an audience, hold attention, read a room (physical or virtual), listen and pivot, etc. Great speakers are remembered, whereas a monotone delivery of 100 features is quickly relegated to the pile of ‘will not continue evaluation’ products,” Hanson explains. “It’s a crucial skill for SEs to have – know what questions to ask and what to listen for and what follow up questions to ask,” Michaels said. “What is the biggest problem we’re solving for this customer? What is their pain and how are we solving it? You’ve got to ask these tough questions. It’s a powerful moment when the customer realizes they don’t have a solution to their problem, and their boss probably expects a solution,” Michaels adds. Michaels made sure his SEs know how and have the ability to identify and connect with anyone, from their champion at the prospect’s company to the economic buyer with the final decision power. But then they took another step. “We followed up after the trainings. You can’t present it one time and expect everyone will master it. We sent printed materials. We had two SEs team up to practice, giving demos to each other and practicing back and forth,” he said. Certainly, CloudShare’s virtual training labs can help provide that important long-term impact for product knowledge retention. When your sales engineers receive hands-on training on exact replicas of your solution, the immersive experience makes learning more engaging, effective and sticky. And if your sales engineers can give a software sales demo on an exact replica of your actual product, showing off its full value, regardless of how complex your solution is, they not only gain credibility with prospects but also increase their own knowledge and retention by the very act of demonstrating it. 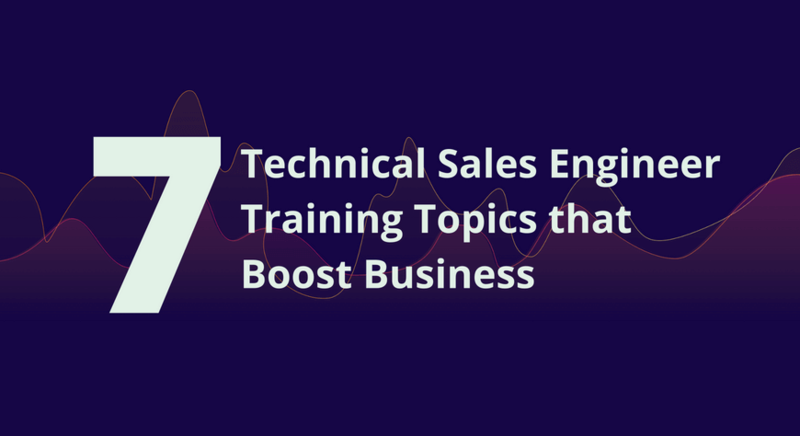 While the technical sales engineer training topics mentioned earlier will enable you to get the maximum results from your SEs in the short term. You also want to retain the talent in which you have invested in developing over the long run. To get your sales engineers excited about helping you get results, let them know you’ve got their best interest at heart and develop multiple career paths that enable different type of SEs to grow professionally. “Some people want to manage teams, others want to be individual contributors, subject matter experts – and they both need to see how they can advance, get promoted, take on more responsibilities. Make sure there’s a career path, so they can be a senior principal or become a manager or director or senior director,” Michaels said. With the growing numbers and importance of sales engineering teams, it’s more important than ever that each SE is trained to provide your organization with maximum value. Training for technical sales engineers not only increases their performance but also correlates with job satisfaction. The better trained your sales engineers, the better your business results will be.